"I could do that if I just knew where to start and what to do." "I could never do that. I don’t know where to start or what to do." Consider how you came to be where you are - doing what you’re doing at this present time. What affect has life’s experiences had on where you are, who you are, and what you’re doing right now? Where did good and influential advice come from? Who influenced you, positively or negatively? You strive to be a “good” daughter, mother, sister, wife, employee, employer, neighbor, and citizen. But, sadly we live in a culture which no longer understands that “good,” is derived from “Godly”. By God’s grace you do understand that. As you strive to be a “good” daughter, mother, sister, wife, employee, employer, neighbor, and citizen do you realize you are striving to be a “Godly” - representing Christ in every aspect of your life? That’s your goal as a Christian. But how do you know what that really looks like? Since the split between the descendants of Cain and the descendants of Seth - between those who served their own interests and those who “call(ed) on the name of the LORD” this dilemma has been a struggle for all followers of the Lord. For everyone who call themselves “Godly”. What does following Christ look like in my life today in the circumstance to which God has called me? As I write this question, I realize it was something impossible to figure out all by myself. Through the years, being in the Word daily and watching “Godly” Christians around me helped me flesh out the application. Three concepts have taken shape and became ideals for which to strive even though I knew I’d never in my sinful state reach them. First, the Holy Spirit needed to call and inspire me through regular use of the Word of God and the sacraments. That prepares me to be God’s instrument, jar of clay though I am, to share the message of reconciliation through Jesus’ life, suffering, death with those around me. Secondly, I need to be led by Christians around me. Then I have a better idea of how to lead others to know Jesus better and follow him more closely. Third, I was served by many Christians; parents, Sunday School teachers, Pastors, choir directors, Christian school teachers, and college professors, employers, friends and relatives. Now it’s my turn to serve others as those other Christians served me. How do you be a “good” daughter, mother, sister, wife, employee, employer, neighbor, and citizen? You look to Christ in His Word and follow the example of those who are doing the same. Guidance on “Godly” living can’t be found in self-help books, popular women’s magazines, news reports, You-Tube or Pinterest. We can only find guidance for “Godly” living in God’s Word. Thank God he has placed “Godly” women in our lives to point us to the Word and show us what a “Godly” life looks like. WELS Women’s Ministry Committee would like to point you to the example of Christ and help you lead a “Godly” life that does the same for others. 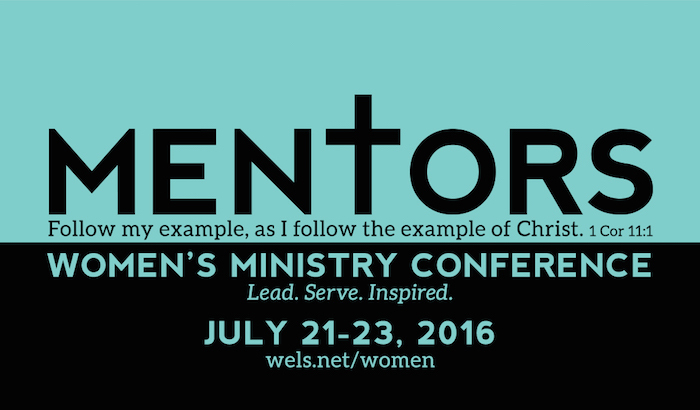 Join us at the Women’s Ministry Conference, July 21-23, 2016, at Wisconsin Lutheran Seminary, Mequon, WI. It will focus on Christ-like mentoring. Our study will look first to Jesus, then to the “Pauls” God has given us in his Word and our own lives. Finally, we will discuss how to be effective “mentors” for those around us. The WELS Women’s Ministry Committee works under WELS Adult Discipleship, part of the WELS Congregation and Ministry Support Group. Our purpose is to assist congregations in nurturing, encouraging and equipping women to faithfully and fully use their God-given gifts to glorify God. Our foundational Bible study, Heirs Together, by Professor Rich Gurgel and Kathie Wendland, is a study of God’s calling for men and women. We have developed a network of women to share and receive ministry information through our Congregational Ministries Team. This team also provides one-on-one support for pastors and women’s groups and is available to assist with developing, transforming, and revitalizing women’s ministries at the congregational level. Our website, provides free, theologically sound Bible studies written by women for women, devotions for various occasions, ideas and resources for women’s retreats, Advent by Candlelight services and other tools for ministry. Some of our resources have also been translated into Spanish. For more information or to register visit wels.net/women. Ladies let me draw your attention to a great opportunity to be encouraged and edified by God's Word together with women of all ages! You know we're all about that! Now you may go to women's bible study, have coffee dates with your special mentor, or have a great support group of Christian friends - great! But let me urge you to still consider the Women's Leadership Conference. The conference is designed to encourage women who want to develop their leadership skills and build up those who are already leading in their homes, work places, and churches. Be encouraged in the Word to use the leadership gifts God has given you to serve those around you. If you are a Women's Bible Class leader, Moms/Kids Group leader, teacher, interested in Women's Ministry for other women, in a leadership position in any way in your workplace or church--this Conference is for you! Christ works through his people every day to bring light to others. Each of us is called to lead whether it's at work, home, school or even just being out and about (you never know who God may have bump into you!) ... to lead people to Christ. Several of us have gone to the Women's Leadership Conference and can recommend that worshiping and studying God's Word this way is a joy! So easily we get distracted checking off the "to do" boxes (even if they are great things to do!) that it may be hard to sit like Martha's sister Mary at the feet of the One - the one thing needful. So if you can, please consider... and go... and sit... and be filled. Want to go? You need to register soon as the deadline is only one week away - June 15! You can register online or by mail. Here is the brochure. The conference is looking to Ezra and Nehemiah for guidance and examples to emulate as Christian leaders. An emphasis will be on application for Christian women who are serving in some type of leadership capacity in the family, church, or secular realm. Following each keynote address, participants will have an opportunity to join in a Peer Discussion Group to discuss daily and practical applications of the keynote address. There will be three different Peer Groups: one for application in the home, one for application in the church and another for application in the secular world. While we all are involved in more than one area of personal ministry choose the one that you feel would be most helpful for you at the present time with an option for a second choice if you’d like. a. Secular - this would be most helpful for those working outside the home in a profession and/or leadership/management capacity. b. Church – this would be most helpful for those in some type of leadership or teaching capacity within their congregation or in a Christian church/school affiliated position/calling. c. Home – this would be most helpful for those who have small children or teenagers at home, those who are single moms and/or are the spiritual leaders in their homes. Online registration is now open. Click here to register. Conference fees are $130.05. And remember the registration deadline is one week away - June 15! For more information, visit the Women's Ministry Web site.